Holy Basil- Can it help your Oral Health? Want to improve your oral health? Try adding some Holy Basil Tea in your diet! Holy Basil is very useful in taking care of your teeth. This herb can be used to maintain dental health by counteracting bad breath, destroying 99% of germs and bacteria in the mouth and this effect last for a long time. 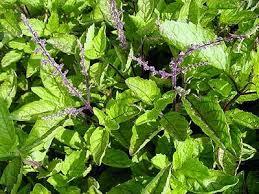 Holy Basil can also be used to treat ulcers in your mouth.